Waiting for the costume pics to be uploaded. Once they are, I'll post some here for a laugh. My brother was dressed as a Jester and decided to recover my old 12-string mandolin from his garage, the first time it has been out of its bag for 20 years!!! 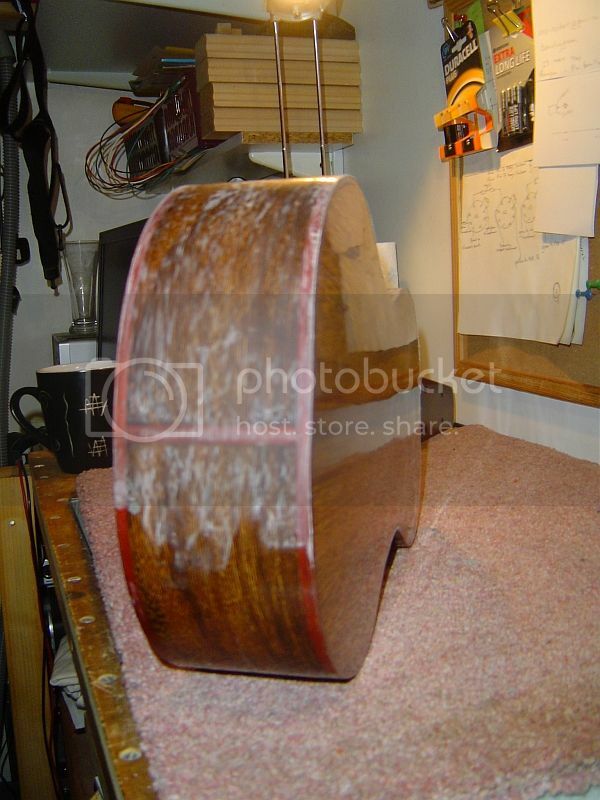 The neck needs resetting (but it always did), it needs a refret, the tailpiece had almost pulled off, and there are some joints opening that need closing again. But it's not in that bad a shape. 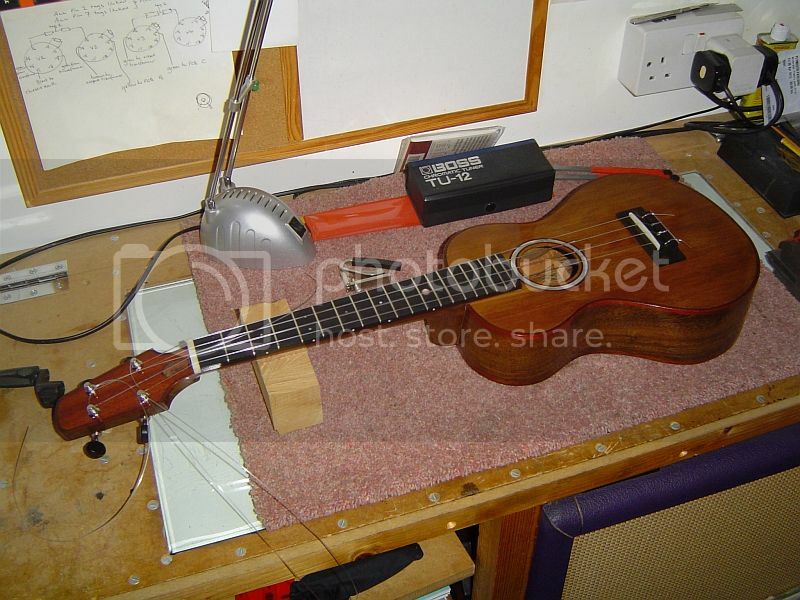 But ukulele polishing, and saddle fitting, comes first. Mixed up a potion today. Some rottenstone, a drop of soap, and some White Spirit. Add a piece of felt. And then apply potion to felt and start polishing ukulele. Have you seen the price of Elbow grease!!!!! More Polishy Walishy stuff today. Going over the front and headstock with the rottenstone mix. Cleaning up. Then grabbing the Brasso and going over everything again. Oh... just remembered. I need to make a truss rod cover of some sort. I've got some thick Ebony veneer lying around if there's nothing else suitable. Another polishing day today. Did some more spotting with the 2000 grit wet & dry and Olive oil lubricant. Then cleaned up before going over the entire instrument with the rottenstone again. And then I got out the cotton pads and Brasso and went over everything twice. Result? Well, there are a few small spots where it could be better. But that would mean ladling on a load more shellac and then working through the grades of wet & dry to achieve perfection before polishing with more rottenstone and Brasso. But we aren't looking at anything major here, and besides, Sod's Law tells us that within a month of finishing general wear and tear would generate enough dinks and marks to catch the eye at least as much. And now all that remains is to fit the machine heads, the nut, and the strings. 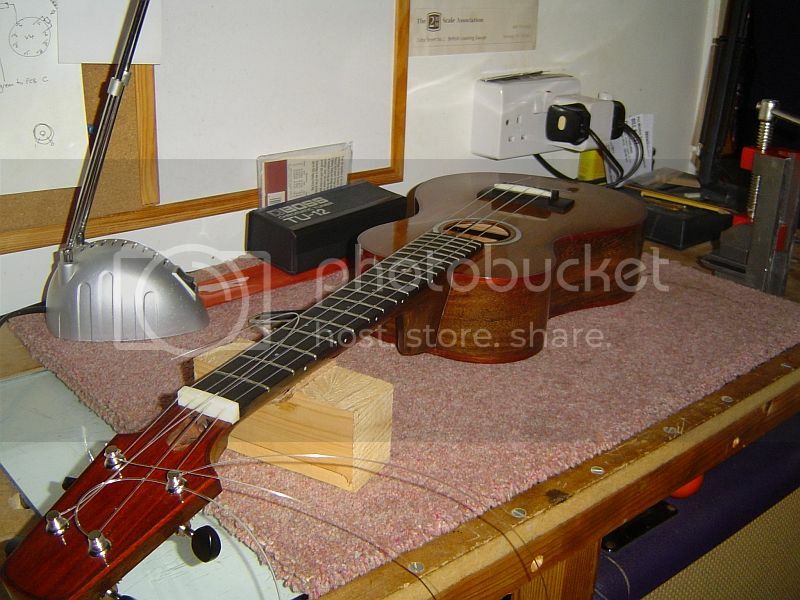 Then mark the correct intonation ready to cut and fit the saddle. So here are most of the bits that are needed. The nut is already rough cut and ready to fit. 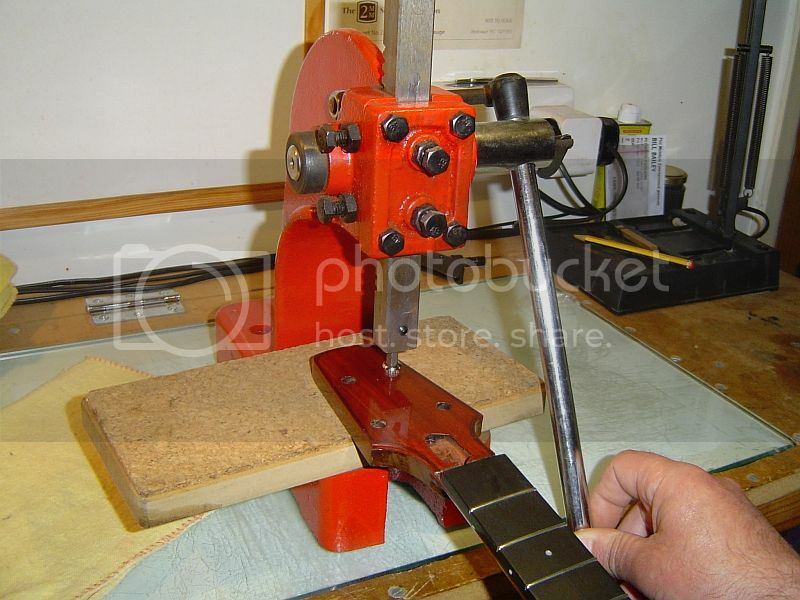 I'll pull out the fret press to press in the tuner bushings. And then I can drop in the tuners and adjust the post heights. 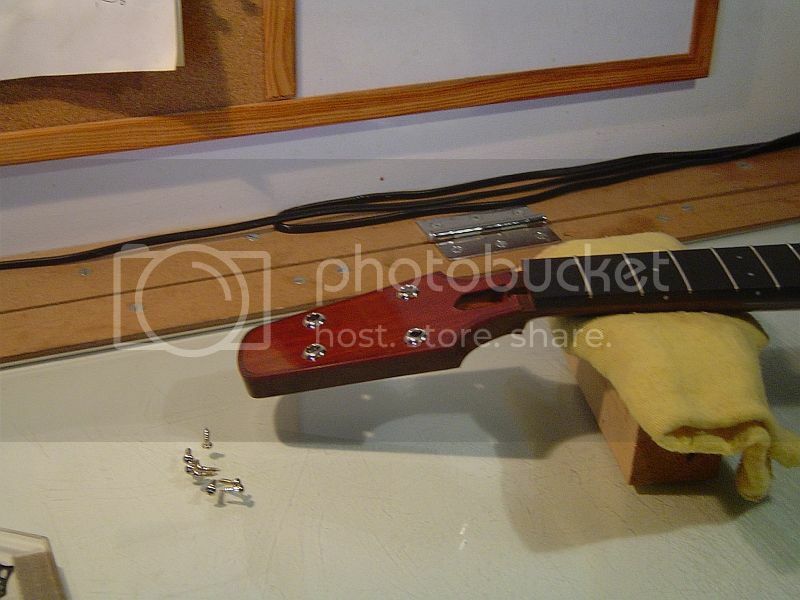 Then I can mark out the nut slots and test fit the strings. With the strings fitted I'll use some temp saddles to mark the correct intonation for each string at the bridge and use the Dremel and saddle jig to cut a saddle slot. 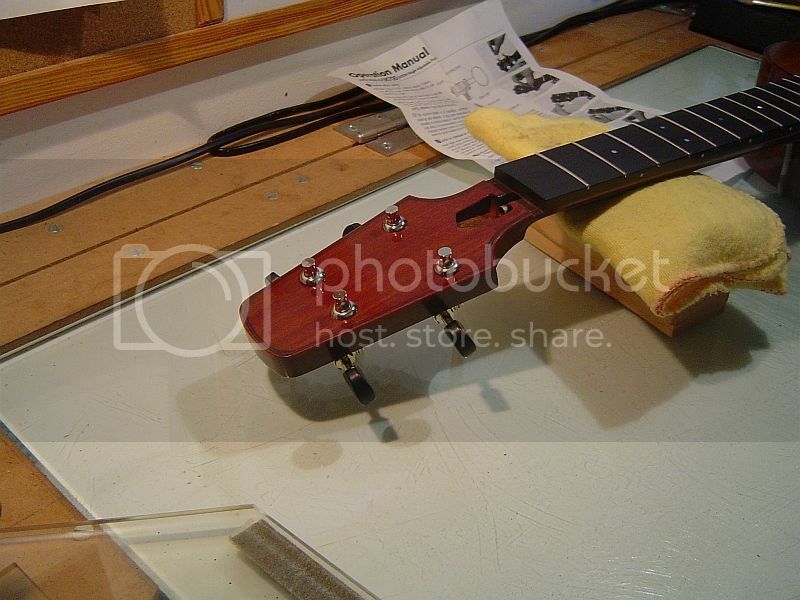 Then it's just a matter of fitting the saddle to the slot and profiling it with the correct intonation. And then this uke is finished. And I promise to grab a decent recording for you all to hear. 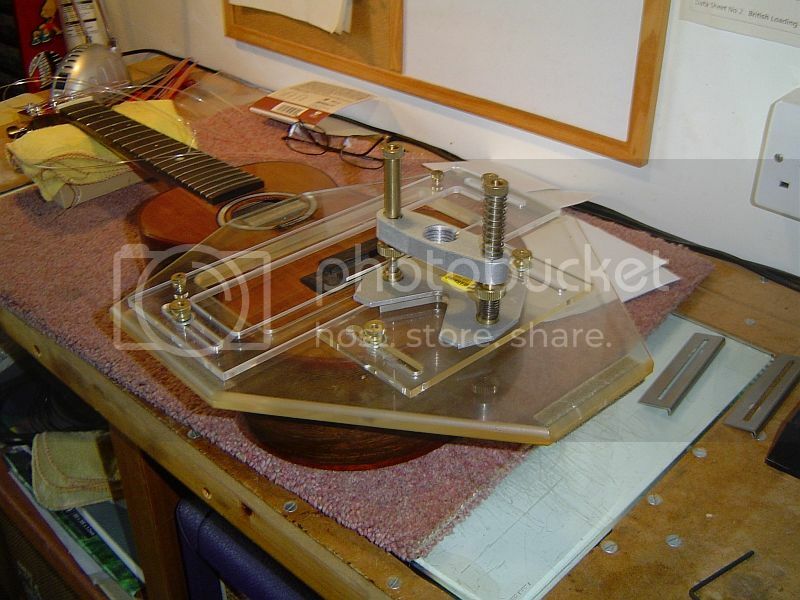 Then it's time to source the parts for the new back for the second uke and get that finally finished too. First job of the day, fit the tuner bushings. 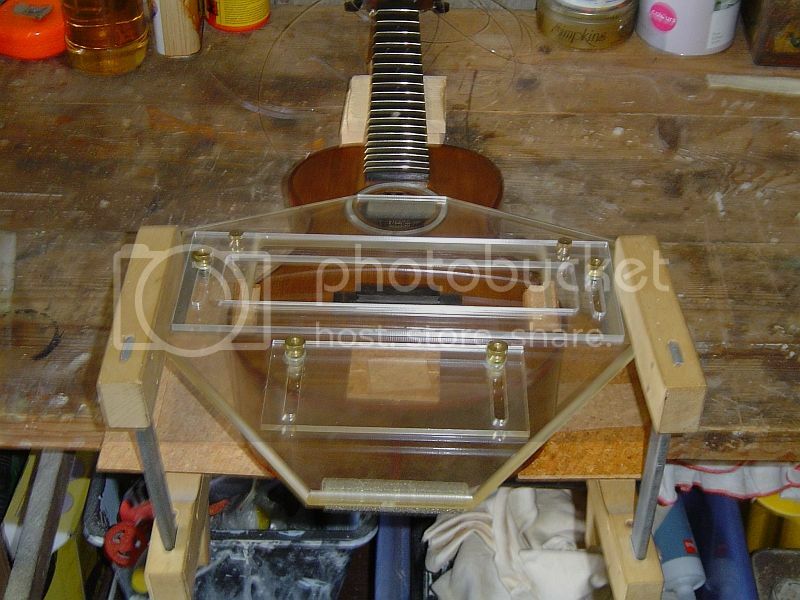 So step one was to grab my Fret Press and then to look at how to make best use of it. A little experimenting found that I had a Star drive Hex bit where the Star drive was just smaller than the standard 6mm Hex. The Star drive tip passed through the bushings, but then opened up wide enough for the shoulder to press through. Everything was in place, and once held in the press it all looked good. Once it went in neatly it was just a matter of doing the other 3. 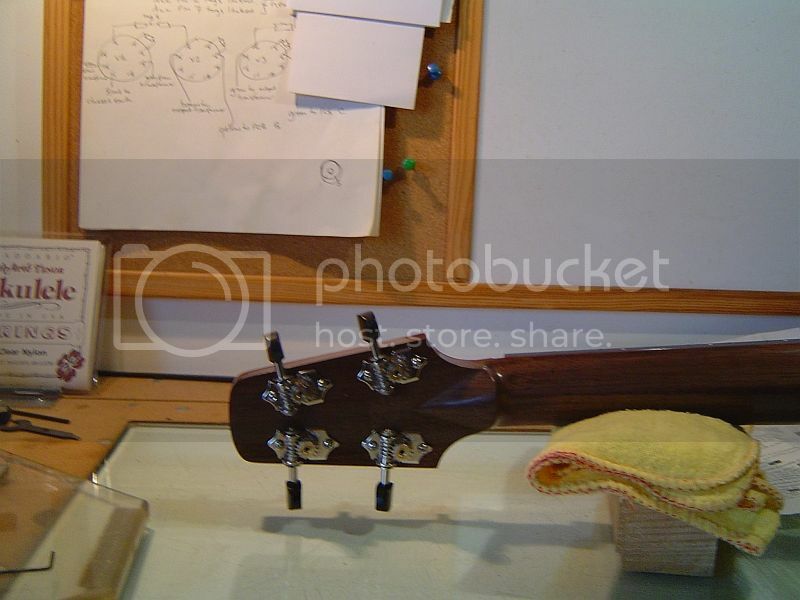 The Gotoh tuners have Height Adjustable Posts. So I took a few minutes to get the post heights correct. A few more minutes with a drill for some pilot holes. And all 4 tuners were neatly fixed in place. All looking good. And tomorrow I just need to make sure the nut is neatly seated, cut the slots, trim it to final size, and cut the slits to depth. 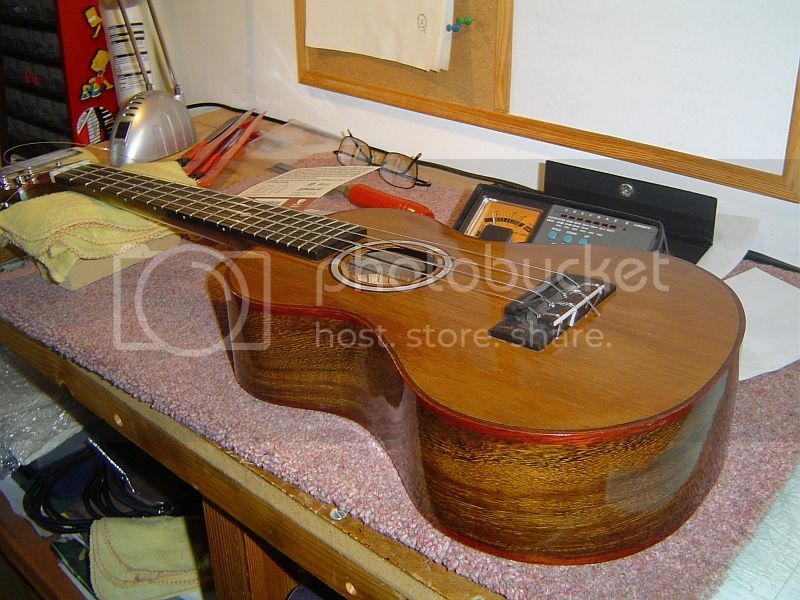 Then I fit the strings, mark out the intonation points for each, and fit the saddle. 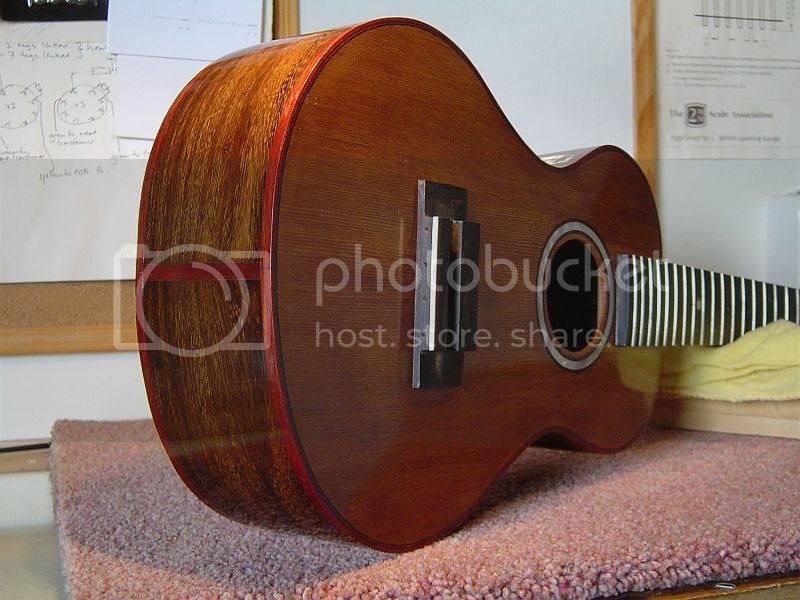 Finish the nut and saddle, and the uke is finally finished. Easy start. Fit nut and mark the string locations. Cut start slots with saw, then take them deeper with the nut slotting files. Fit strings. Then it gets frustrating GGGRRRRRRRR!!!!! 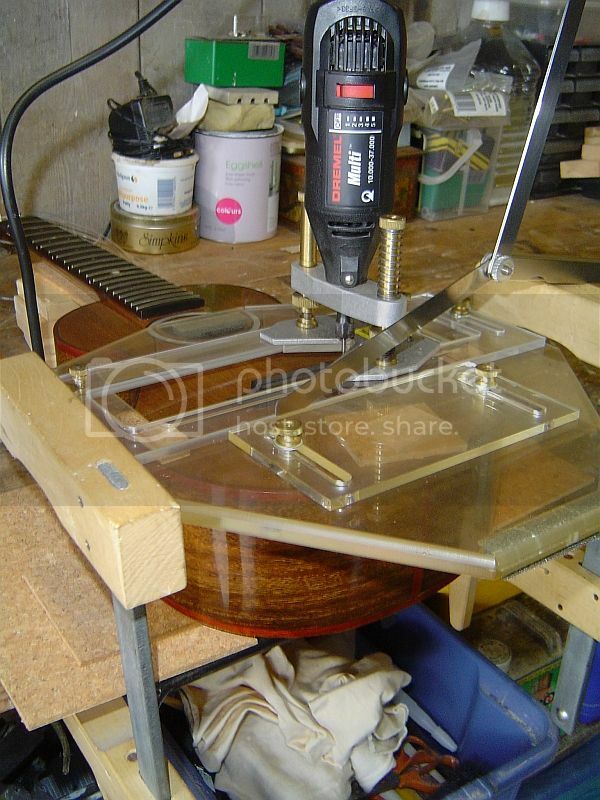 The StewMac saddle slotting jig for the Dremel and router base is brilliant. Let's you line up the saddle slot VERY accurately and lets you cut a very neat slot with a perfectly flat bottom. Ideal. 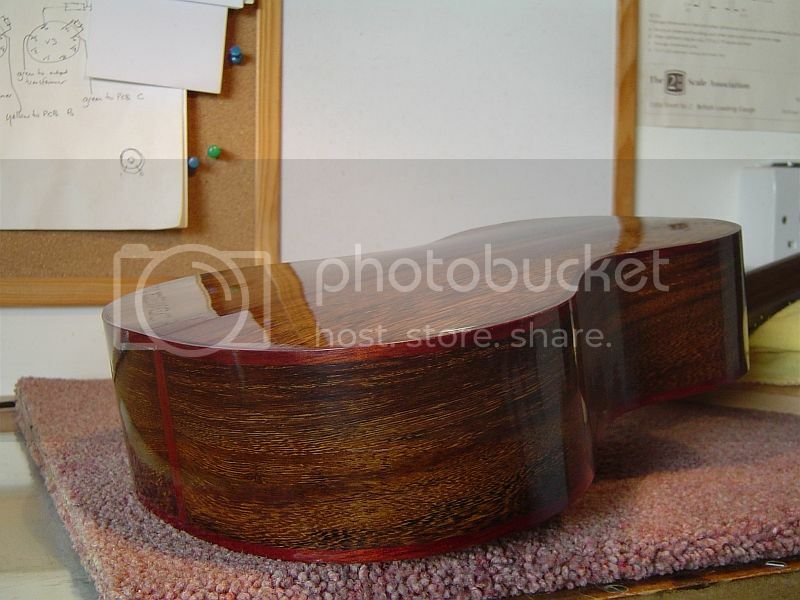 However, it's designed to sit on a guitar, not a cute little ukulele so is just too big to use as designed. OK, flip it around 180 degrees and it will work. Now I just need to work out how to assemble everything neatly and securely. 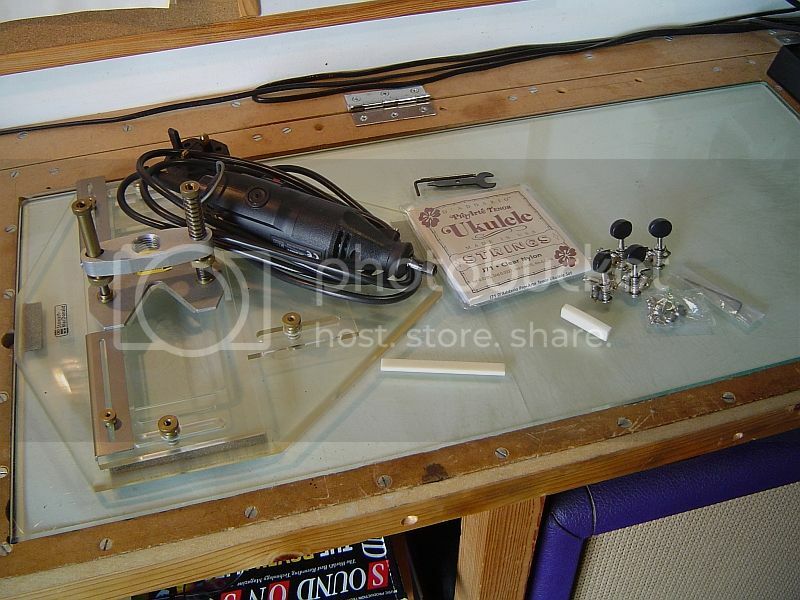 If I had a proper workbench it would be easy. 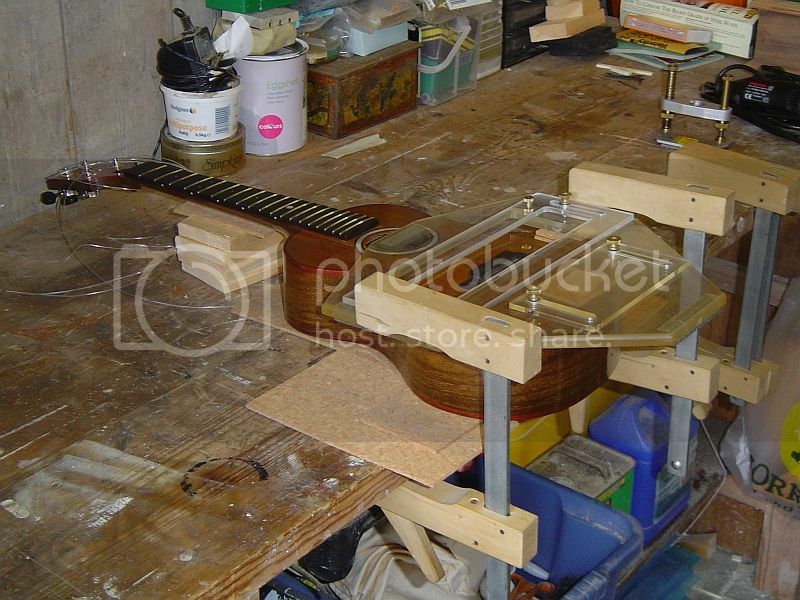 Screw down some padded supports for the uke body, screw down a couple of rails for the jig to sit on. Job done. Ten minutes work with a bandsaw and some scrap wood, easy. Yep, plenty of protective cotton. And that carpet on the bench gets a regular vacuuming too. And decided on the course of action. Monday or Tuesday should see it finished. And then I'll find a volunteer from the local ukulele group to play it while I grab a recording. 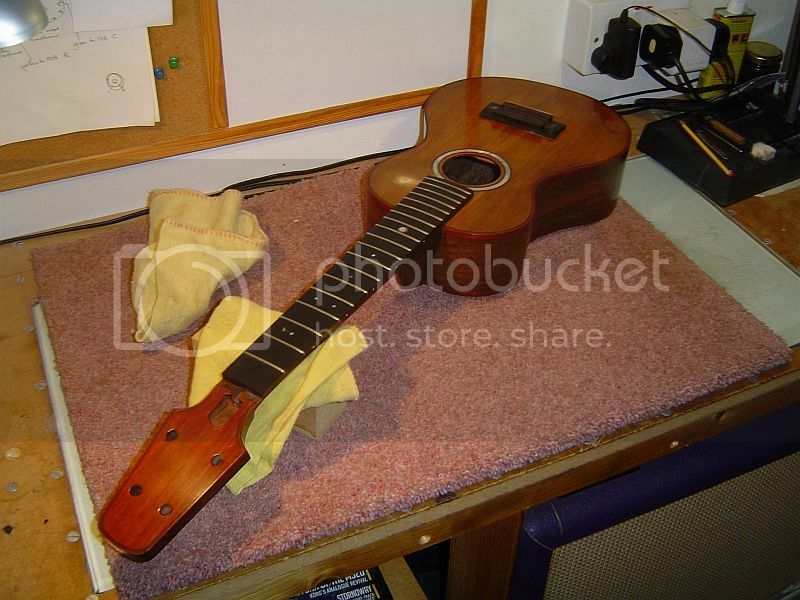 zenguitar wrote: ... then I'll find a volunteer from the local ukulele group to play it while I grab a recording. And a frustratingly wet week too. 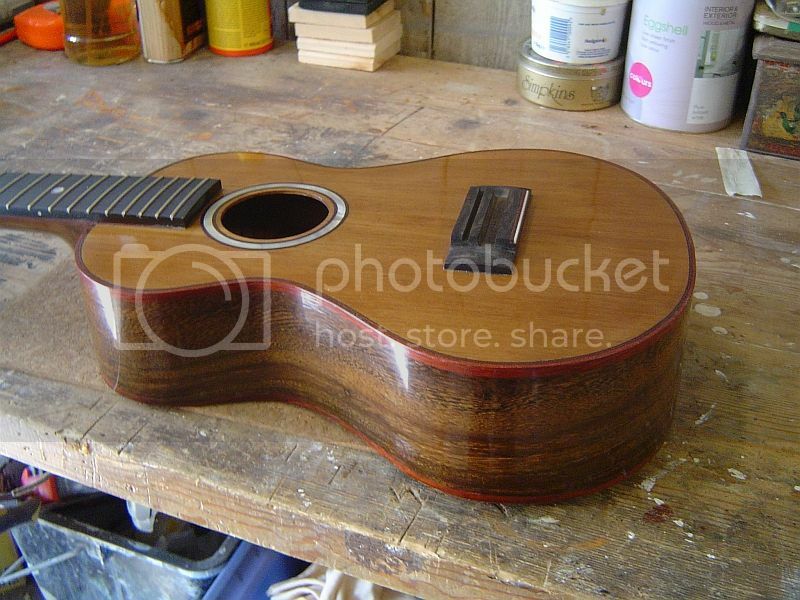 Waiting for the weather to ease so I can get the uke on the bench and fit that saddle. It's all marked out ready to go, just need a dry day to cart everything to the the bench in Mark's garage, knock up some support for the jig, and make some ebony dust. I took my frustration out on the mandolin. Frets removed this afternoon. But it is fighting back far more than expected. I applied some SERIOUS heat to the fretboard but it just won't separate from the body. I bought it from a widow in the late 70's, it had belonged to her late husband and I do recall that she told me that he converted it (or had it converted) from an 8 string to a 12 string in the 60's or possibly earlier. Right now I'm starting to wonder what on earth was used to glue it back then. The fretboard is weeping resin under heat (and it smells great) but a hot knife is making no impression whatsoever. Looks like the next step is to apply a fresh Stanley knife blade and a hammer!!! Lets hope the weather improves tomorrow so I can deal with a sensible ukulele instead. I commit to taking on the freezer in a fight to the death (defrosting with the aid of the steam cleaner) and the weather makes a turn for the good !!! And so it came to pass that the sun shineth all afternooneth. So I packed everything that was needed and made the epic stroll up the road to Marks house where there was space on the workbench. And with coffee on hand I found the bag of cork padding and worked out a nice clamping arrangement. Frustratingly, I could have done this at home if my bench was 6" deeper !! Anyway, then it was time to line up the router cutter. I had marked the location of the temporary saddle (the allen key) by making scalpel marks either side at the bass and treble sides. The jig allowed me to align the back of the saddle on base and treble sides with the router bit. And after some fine tuning I could make the first cut. After a few passes, going deeper each time, I had to widen the slot. Easiest way is to use feeler gauges to measure the width of the 1st cut, then compare that with the saddle and see how much more you need to add. One important thing to remember is that you fit the saddle to the slot, not the slot to the saddle. So I picked a feeler gauge that added enough extra width without getting as wide as the saddle blank. 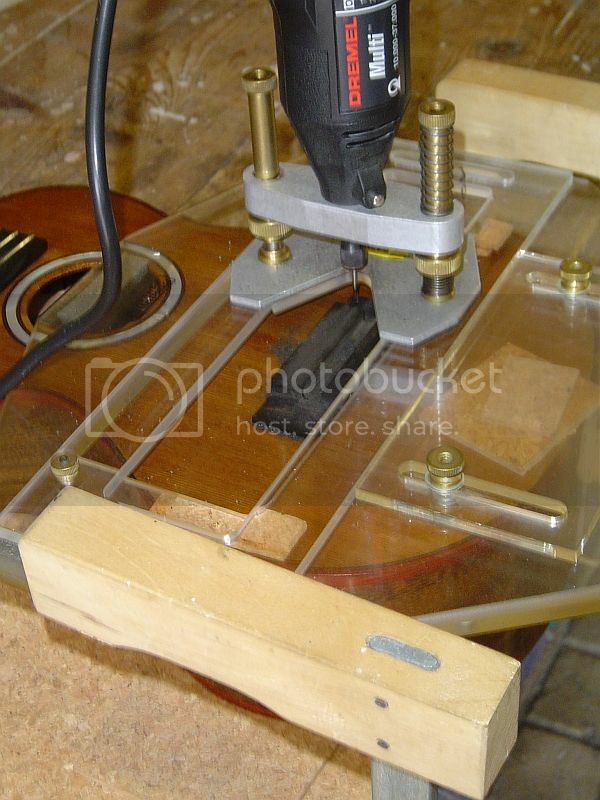 And once I had the gauge I used that to space the jig for the second cut. And after checking and double checking, I made the second cut with a few passes of the Dremel. Tomorrow I fit the saddle and nut finally, shape them, polish them, and tune up. And then I need to find the local tenor Uke champion to grab a recording. 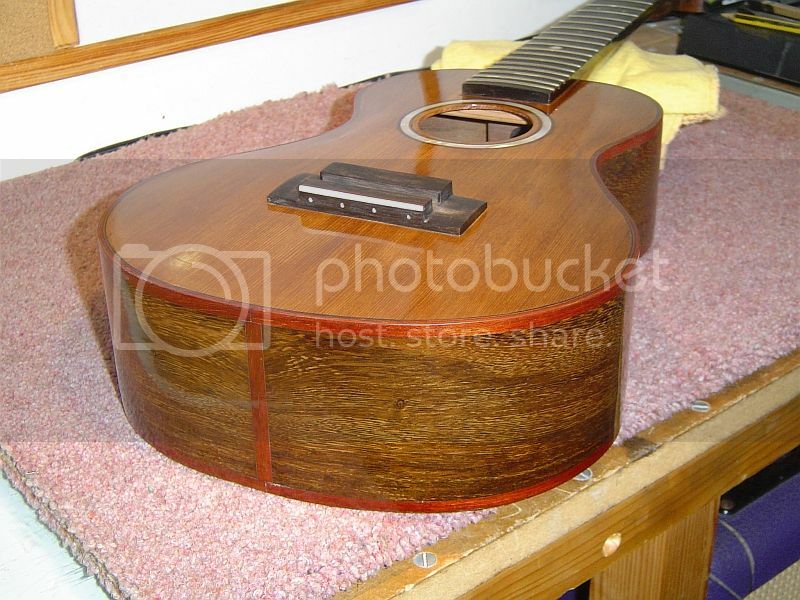 Then I roughly profiled the saddle with a curve to match the fretboard radius. And at that point my hands hurt too much to do much more. So I strung the uke up and brought it up to pitch and decided to let the strings settle down to pitch before doing anything else. So, almost done. And some test strumming shows plenty of tone and volume on tap. And more importantly, I know what needs to be done to get it finally finished. zenguitar wrote: Mixed up a potion today. Some rottenstone, a drop of soap, and some White Spirit. How exactly do you mix it, what sort of soap, proportions of each ingredient and so on? 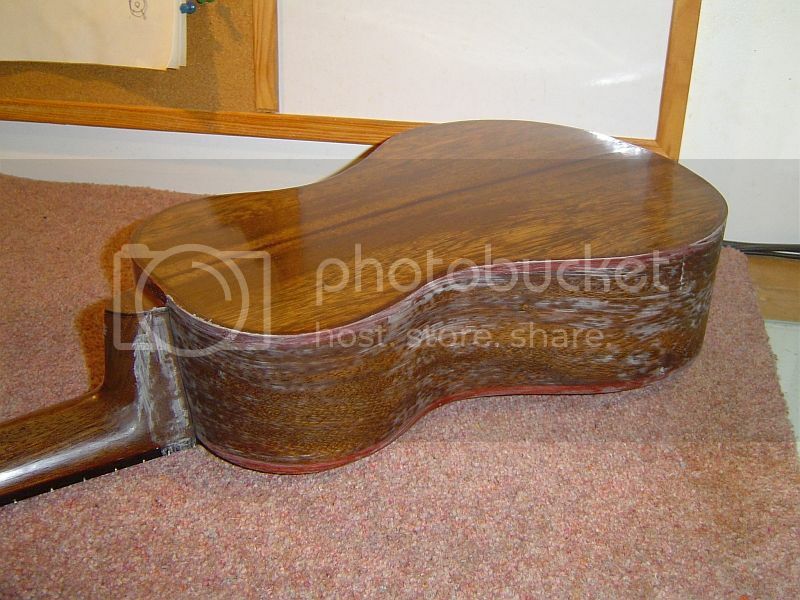 Would it serve to polish down a violin which has been revarnished with an oil based violin varnish? 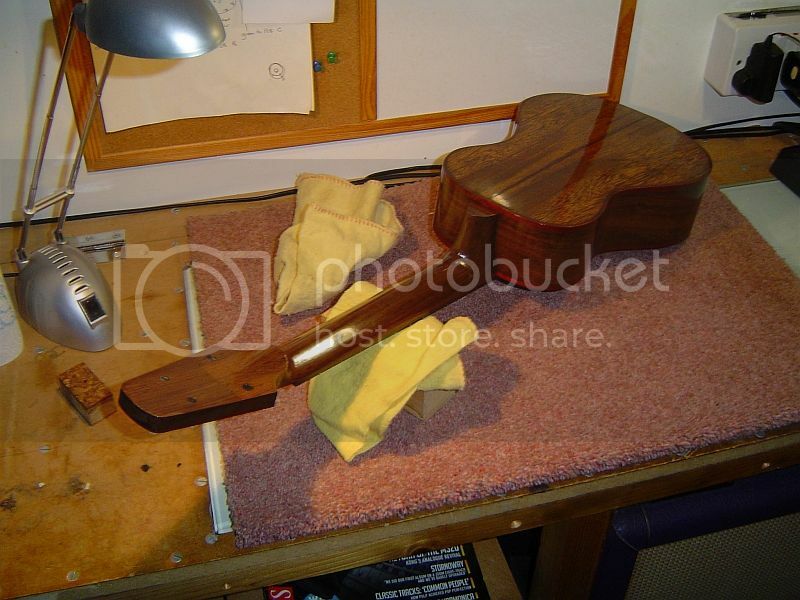 I'm a self-taught violin repairer. I've happily learnt most of the skills of violin making and repair, and bow rehairing, all to my own and to my customers' satisfaction and I've made a couple of violins. However, the one thing I've always struggled with a bit is finishing. You can read as much as you like, but there's nothing like getting as much personal advice as possible. I've got a couple of nice old student violins to hand which were so badly distressed I decided to strip and revarnish them. I'm about to polish them down, and I'm intrigued by your 'potion'. I've loved dipping into this thread, can't wait to hear the recording!